When planning for a meal, a lot of us think of which fish or meat to prepare but don't necessarily give that much thought to what it will be served with. Side dishes, as their name suggests, are often an afterthought and not the protagonist of the meal. While simple salads, pasta and rice are lifesavers during busy workweeks, it's practical to have a few simple, healthy side dishes that you can quickly whip up and that will add to whatever it is that you're serving. French cooking is pretty brilliant when it comes to tasty side dishes. I grew up eating a variety of delicious side dishes that could almost make a meal on their own. Some of my favourites are garlicky haricots verts, butter-glazed carrots, "poireaux vinaigrette" (velvety soft leeks with dressing), endive salad with Rochefort, walnuts and apple. This cauliflower dish came about after browsing through a couple of Mark Bittman's cookbooks, and I've added it to my list of easy side dishes that turn a meal from ordinary to one filled with colour and flavour. What are some of your favourite side dishes? Add a good drizzle of olive oil to a hot pan on medium heat. Once the oil is warm, add the cauliflower in one layer and leave untouched for 3-4 minutes or until the cauliflower starts to brown. Give the pan a stir and add the olives, parsley and a good pinch of salt and pepper. Cook for another 2-3 minutes. Add the bread crumbs and stir until the bread crumbs are golden and toasty. Serve immediately. Enjoy! Mmmm cauliflower is one of my favourite vegetables but funnily enough I don't really like it raw at all, I prefer it roasted! The technique you describe in this recipe sounds good too - I just tried something similar with a new pan, using broccoli and it worked very well - lots of nice flavour in the heads, but the stems weren't overcooked at all. I like to use make one pan meals and I have found cauliflower is a good base - start a pan roasting, then roast some fish on top. A scatter of lemon, green olives and parsley at the end - delicious! Estupendo!! sano y delicioso!! tiene muy buen aspecto. I'm so happy that I have all of the ingredients at home already! 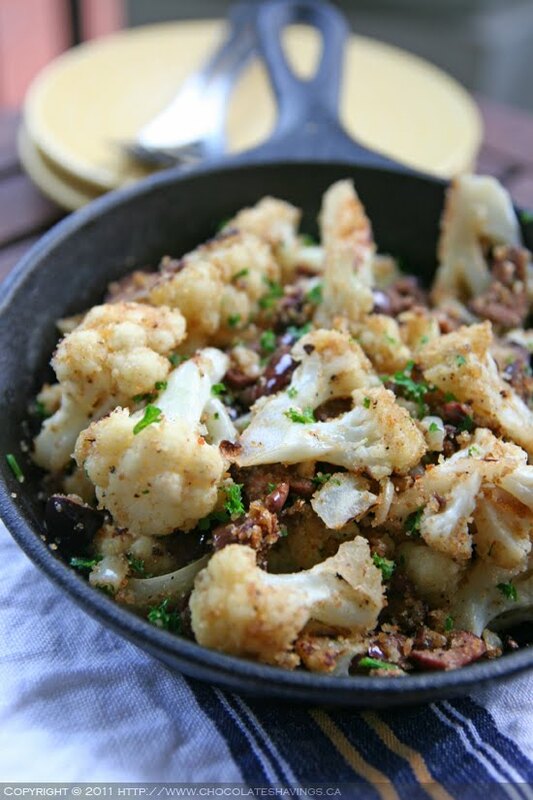 I love cauliflower and this recipe seems so tasty. I have to try it! I usually oven roast cauliflower and like how the sweetness of the vegetable is enhanced. Your recipe is enticing, easy yet full of flavor. I will be trying this soon. I just found your blog. Your food styling and photography skills are top notch! I will definitely be back for more! Jenniffer: Thank you- I'm glad you like it! THis looks and sound wonderful. I love simple and flavorful side dishes like this one. Thanks for sharing. This looks so rustic and comforting; definitely a dish for the fall. Beautiful picture! Tres Delicious: It's definitely a delicisously healthy side dish option! I'm rediscovering a love of cauliflower, but generally prefer to eat it after roasting. This method sounds tasty, too, though! Thank you for sharing this. I'm always on the lookout for new recipes for side dishes (and healthy ones, at that). Lauren: Sautéing the cauliflower really gives it great flavour (and it's a fast meal to make too!). Let me know if you get to try it! I love cauliflower and make a variety of dishes with these. Loved your recipe and presentation.